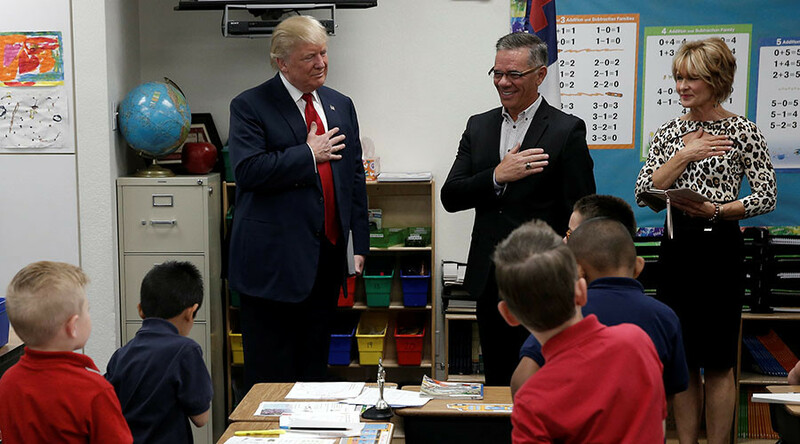 Teachers across the US are getting in trouble for bringing their views on President-elect Donald Trump into the classroom. Whether it’s threatening students with deportation or comparing Trump to Hitler, the politicizing of education is seen as a no-no. While public school teachers are afforded the right to free speech under the First Amendment, that freedom does not extend to what they say in the classroom because public school students are considered “a captive audience,” according to the American Civil Liberties Union. It’s inside the classroom that teachers around the country have been getting in trouble. A teacher in Wesley Chapel, Florida is on administrative leave for reportedly threatening students with deportation. Wesley Chapel High School teacher and coach John Sousa approached several African-American students in the hallway to ask them what they were up to. He then told them: "Don't make me call Donald Trump to get you sent back to Africa," the father of one of the students, Donnie Jones Jr., wrote on Facebook. Jones complained to the school, which quickly condemned the remark, which Jones says Sousa admitted to. The teacher met with the school’s director of employee relations on Friday to discuss the matter, school officials told WPTV. Sousa apologized and called it an "off the wall comment that wasn't meant to be racist." One of the students said that Johnson told them: “I scaled your tests 10 points because so many of you did so poorly. I could have just taken points from the ones who did well. Those of you who like Obama and Hillary, that's what they would do. It's gonna take a lot of work in the next four years to undo what was done in the last eight years," according to a Facebook post by Northridge alumnus Alex Smith. A physical education teacher at a middle school in Los Angeles, California was fired after he was recorded making threats against minority students, KCBS reported. A 6th grader at Bret Harte Preparatory Middle School recorded the long-term substitute telling minority students that their parents would be deported. Los Angeles is one of a handful of so-called sanctuary cities that have refused to enforce deportation laws, and have stated that they will continue that under the Trump administration. A Holocaust expert who teaches history was suspended from a high school for pointing out similarities between Trump and Adolf Hitler during a lesson in Mountain View, California. Frank Navarro was placed on paid leave after a parent complained about the lesson. “This parent said that I had said Donald Trump was Hitler, but I would never say that. That’s sloppy historical thinking,” Navarro told the San Francisco Chronicle. Rather, he said, he outlined the common traits of Trump and Hitler’s pre-election campaigns. Pawlicki apologized for the “ill-considered” remarks and stepped down from his position. “There is no indication that he has the inclination (much less the means) to flee or will otherwise fail to appear as may be legally required. Moreover, Dassey has a strong interest not to flee,” Duffin wrote. He must remain in the Eastern District of Wisconsin and is not allowed to obtain a passport, possess weapons or controlled substances. He is also not allowed to contact with his uncle Steven Avery, another convict in the case, or with members of the victim’s family. A social worker would help Dassey to “adjust to freedom following his decade in prison” while he will also be supervised by the United States Probation Office.